During the Early Cretaceous, a reorganization of lithospheric plates led to one of the major volcanic processes: the Paraná Magmatic Province (PMP) that covered an extensive region of Brazil, Paraguay, Uruguay and north-eastern Argentina. It was a tholeiitic event constituting a large igneous province (LIP). By contrast, an alkaline volcanism also occurred but it is volumetrically restricted, has a peripheral location with respect to this LIP and took place either prior as well as contemporary and posthumously to that large tholeiitic episode. 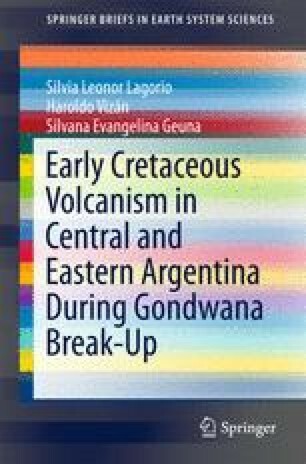 Both volcanic events are Early Cretaceous and must be linked to the break-up of Western Gondwana. In the Province of Córdoba (central Argentina), alkaline volcanic rocks outcrop in Sierra Chica (SCC), and were generated under extensional conditions integrating a system of rifts. They are located about 150 km west of PMP basalts that are lying in the subsurface of Chaco-Paraná basin. Recent radiometric dating provided by other authors revealed ages of 134.7 ± 1 and 131.6 ± 2.3 Ma for PMP basalts, whereas interbedded acid rocks show 137.3 ± 1.8 and 134.3 ± 0.8 Ma, respectively. A new 40Ar/39Ar dating of 129 ± 1 Ma is here presented for the volcanism of SCC, indicating that it is slightly younger than that of the PMP. Both volcanic events must have had different origins in the context of reorganization of geological plates during the Early Cretaceous.